TO THE 2014 BIG APPLE AWARD FINALISTS!!! And buy your tickets here! What’s better than winning an award? The bragging rights that come along with it! Our Big Apple Award winners receive the ability to sing their own praises to customers, potential clients, vendors and colleagues. As a finalist they share the field with esteemed and respected colleagues. Comments Off on Finalists! Big Apple Awards!!! WELCOME to the Big Apple Awards! Buy Tickets HERE! Comments Off on Big Apple Awards 2014! 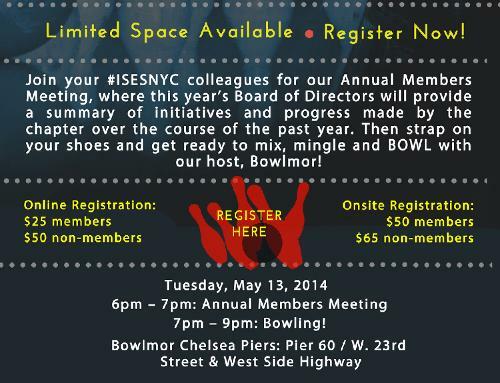 Annual Members Meeting and BOWLING! Comments Off on Annual Members Meeting and BOWLING! Photos from Robin Hall Speaks EVENTS! A great time was had by all at the Landmarc at Columbus Circle, a high-end restaurant that also has private event spaces for hire, hosted ISES as Robin Hall spoke of his time at Macy’s in the Parade and Entertainment Group. Comments Off on Photos from Robin Hall Speaks EVENTS!